Seven years ago, a visit to watch a fellow teacher use Cognitively Guided Instruction (CGI) in her classroom changed my life. I thought: “Wow, how cool — one rigorous word problem solved in a variety of ways was used to teach kids math.” Over the next year, I made up these grand word problems, posed them to my students and had them share their answers. Then, I found out what CGI really was and boy, I had it ALL wrong! After three years of CGI training, I realized that it is so much more than just solving a word problem. CGI-trained teachers use the way their students are thinking about math to guide instruction. These teachers carefully select student-derived strategies to move each member of the class along a continuum in their mathematical reasoning and understanding. CGI is not a stand-and-deliver approach. The students are leaders, as the teacher facilitates learning through the use of questioning strategies and thoughtful selection of student work. Analyzing how students are solving problems drives the next problem posed. There is no book, no set path. 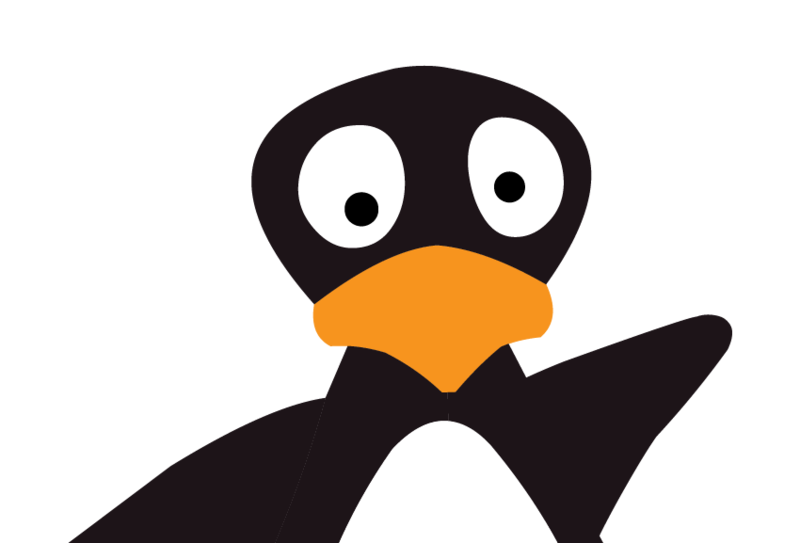 When my daughter started using ST Math in first grade, she’d come home telling me about this penguin named JiJi who helped her “figure out math.” I remember a time when we were driving in the car and she said, “Mom, give me a problem to solve.” Since she was only in first grade, I started with a simple addition problem; she blurted out the answer right away. Then I followed up with: “If there are 18 dogs, and 38 more come, how many dogs are there?” Quickly, she answered, “56.” WHAT? How did my little 6-year-old figure that out so quickly? I asked her to explain what she was thinking. She said, “Well, I know that one 10 and three 10s is 40. I also know 8 and 8 is 16. So, that’s easy … 40 and 16 is 56!” From there, we moved on to playing with subtraction, multiplication and division. And, what I realized was, she could figure out a way to solve them all! When I found out my own school was going to implement ST Math, I knew mathematical instruction school-wide would look very different, and that excited me! After seeing my students’ mathematical thinking grow with CGI, and watching my own daughter’s relational thinking develop through ST Math, I knew the marriage between CGI and ST Math would be organic. Just about that time, the MIND Research Institute provided our district with an amazing opportunity. Through a professional development course designed to emphasize the Standards for Mathematical Practice, specifically (3) constructing viable arguments and critiquing the reasoning of others and (4) modeling with mathematics, our teachers were able to blend what students were learning through ST Math with key components of CGI. The same five steps we had been practicing with Cognitively Guided Instruction were the same five steps modeled to bring ST Math puzzles into the classroom. To illustrate the connection, early on in the year a few years ago now, I noticed several of my students were stuck on a particular level in ST Math called Critter Two-Digit Addition. The puzzles in this level deal with addition, but the change is unknown: 2 + [ ] = 13. As I watched one student, I noticed she was counting up from the first addend and was trying to keep track of her counting on her fingers, even as she crossed over 10. Even though counting up is a valid strategy, was it the most efficient for solving this problem? As she was getting into higher numbers, she didn’t know where her answer was. Was it on her fingers? Was it the last number she said as she was counting her fingers? I knew she (and several others) needed some context and manipulatives. Because this student wasn’t the only one struggling with this concept, I knew it was the perfect problem type for our class’s next CGI problem, Join-Change Unknown. Critter Two-Digit Addition game in ST Math. In planning the CGI problem, I considered several number choices that would allow for several different strategies to emerge. I chose the following problem: “Keira knew 19 cheers. Her coach taught her some more. Now she knows 32 cheers. How many cheers did her coach teach her?” It was important for me to anticipate how all my students would solve this problem so as strategies emerged, I could carefully pick just the right ones that I thought would move my students along the continuum in their thinking. As I watched her solve the problem, I noticed she used unifix cubes and the exact same strategy she was using in the lab while trying to solve Critter Addition problems. Other strategies being used by her classmates involved counting back, removal in chunks, and adding up in chunks. 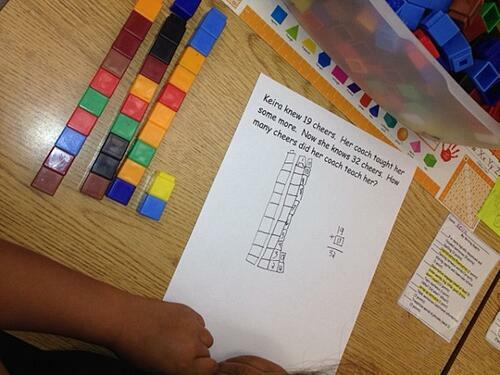 Students try different strategies to solve the problem. I had to be careful about whose strategies I picked to share, and I wanted to make sure these students who were struggling with this concept were the ones making the connections. During “Share Out,” we shared a variety of strategies: counting up by ones, counting up in chunks, and counting back. We discussed which of those strategies was quick and efficient, and asked if certain strategies would work better for certain number combinations. The following week, we were back in the lab. As I was walking around, paying particular attention to that target group, I noticed that they were all successful, and JiJi was on the move! I made sure our next CGI problem revisited that same problem type, only with higher numbers, and I wanted them to use relational thinking rather than counting by ones. For some, it took several CGI problems to get comfortable with this new way of thinking, but with visual support through ST Math puzzles, most of the students in that group made the connection right away and were able to practice these new strategies with JiJi. In this case, I used ST Math to drive CGI, but the road goes both ways. Throughout the years, I’ve watched students struggle with certain problem types in CGI. After working through those same concepts in ST Math, they’ve transferred that learning to help them solve CGI problems. They are applying what they’ve learned to new situations and different contexts with high levels of success. Because of this marriage between ST Math and CGI, I’ve let go of the book, feeling satisfied that my students are learning every single Common Core standard and more. Darcy Lewis currently teaches kindergarten and is a Cognitively Guided Instruction coach in the Huntington Beach City School District. She has 16 years of experience in Kindergarten through 3rd grade. As an independent contractor trainer for MIND Research, she conducts ST Math trainings for new teachers. This blog was orginally published June 4, 2014 and has been updated with more information.